Steve Tiernan and Matt Heuer built squads that consistently won state championships and competed for league and sub-state titles on a near-annual basis at Baileyville B&B and Hanover. On Tuesday, Tiernan, now in his fourth season at Osborne, thought back to the B&B and Hanover matchups. He had one of his first games as a head coach versus the Wildcats. Another occasion, B&B and Hanover played in a mudbath because of rain. For another game, Tiernan said 11 inches of rain fell and cancelled school but not the contest. Teams played a sub-state game in a blizzard. Once, the Falcons dominated Hanover in the first half and led by two scores at intermission. Then, lightning came and the contest was postponed until the next day. Hanover scored two touchdowns in the first minute once the game was resumed. In 2010, B&B played without its starting quarterback and guard, couldn’t pass and defeated Hanover, 31-28, on a 25-yard Logan Haug field goal in overtime. On Thursday, Hanover plays host to Osborne in a matchup that carries a B&B/Hanover gravitas. Hanover and Osborne are both 8-0 and ranked No. 1 and No. 2 in Eight-Man, Division I. It marks the first time Tiernan will face off against Heuer since his B&B days. Both teams have qualified for the playoffs. The winner earns District 4 title; the squads could match up in the sub-state championship in three weeks. 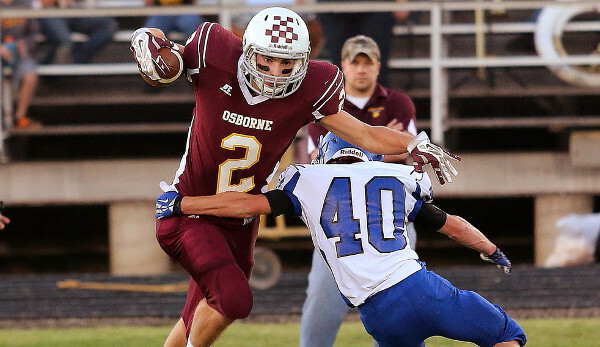 Osborne has won 21 straight contests, the state’s longest eight-man winning streak. “We are going there to win the game, but we are probably not going to open up the whole playbook for this game just for that reason – and there is no guarantee that we are going to play them again, too,” Tiernan said. The last several years, Hanover and B&B matched up in districts and then again in sub-state. Hanover lost both games (34-22 and 60-14) in 2013, and 2012 (52-46 and 50-20) and fell 51-6 in the regular season in 2011. In 2010, Hanover also fell to B&B in the regular season (31-28) and sub-state (48-22). In 2009, Hanover went 12-1 with a state title and the lone loss to the Falcons. In the past, Heuer said sometimes he will make adjustments or some wrinkles for the rematch. Hanover, 86-23 under Heuer, has switched back to Eight-Man, Division I after multiple seasons at Eight-Man, Division II. All eight Wildcat starters on each side of the ball started at least one game last season. Senior Ethan Fritschi is arguably eight-man’s best linemen and senior quarterback Andrew Bruna has played well again this season after he started last year and part of his sophomore season. Hanover’s biggest victory was a 52-6 Week 3 victory at Wakefield, a 6-2 squad that fell 56-54 in overtime at Osborne last Friday. “I thought we did a pretty good job of coming out and hitting them in the mouth before they really had a chance to react to it,” Heuer said. Osborne, which set the state eight-man record for offense last season, stands sixth in offense (418 points) and ninth in defense (146 points). Junior quarterback Jake Tiernan - the coach’s son and whom Heuer remembers on the B&B sideline when he was younger – has delivered another outstanding season. He has completed 74 percent of his passes for 1,330 yards with a 23/3 TD/INT ratio. Many unsung players who didn’t see much playing time (or weren’t on the team) have stepped up from last season’s Eight-Man, Division I state championship. Sophomore running back Cullen Grabast leads the team with 640 rushing yards, and senior Richard Zeiters, a transfer from Logan-Palco, has 592 rushing yards. Senior Matt Pfannenstiel, also a transfer, has a team-high 10 tackles for loss. Senior Shane Hendrickson, a returning starter, has played great at center and linebacker. “Gets the most out of his ability,” Tiernan said. Osborne trailed Wakefield 28-26 at halftime, but the Bulldogs scored on the last play of the first half. Osborne threw deep into the end zone, earned a defensive pass interference, then scored and tacked on a two-point conversion on the next play. Osborne outscored Wakefield 14-6 in the third quarter. “We saw as good a team as I have seen in quite a while,” Tiernan said. Tiernan was pleased with his squad’s resiliency. In the third, Osborne held Wakefield on third-and-short and fourth-and-short, scored, then recovered a squib kick when it bounced off a Wakefield player directly back to the Bulldogs. “It’s too bad anybody had to lose that game,” Tiernan said. The win gave Osborne a playoff berth and set up another Heuer/Tiernan matchup with major implications – possibly the first of two.